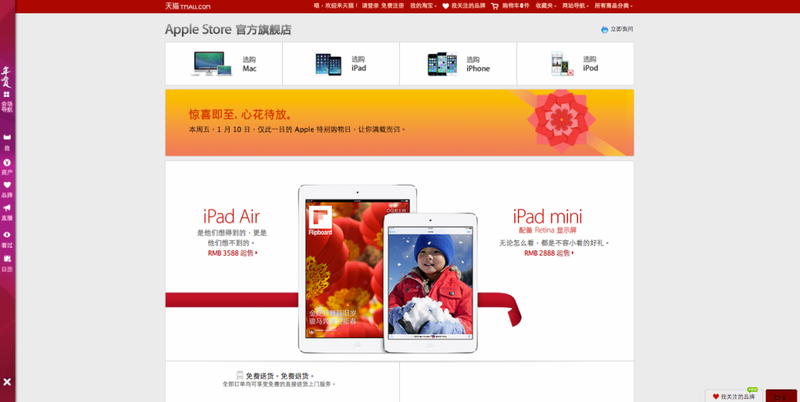 Apple has set up an official store on Tmall, the marketplace operated by e-commerce behemoth Alibaba. Tmall is currently the world’s second largest online retailer and is set to overtake Amazon’s top position by 2015, says analysis firm Euromonitor International. The Cupertino, California-based company already has 10 Apple retail stores in four Chinese cities and its own China-facing site, but using Tmall gives it a major new channel, as well as several new marketing tools. As the Wall Street Journal reported, expanding its retail presence in China is important because, as in the rest of the world, the iPhone’s market share there has declined as it faces competition Samsung and other Android device makers. Setting up shop on Tmall gives Apple access to Alibaba’s new social networking tools, which Alibaba developed after inking a strategic partnership with Sina Weibo, the highly influential microblogging platform with 50 million daily active users. Yesterday, the two companies launched Weibo Payment, which integrates with Sina Weibo and helps users to engage in a “social shopping” experience. For example, when someone shares an item, a “buy” button now automatically appears that lets his or her followers view product details and purchase it using Alipay, Alibaba’s payment platform. 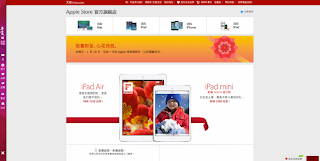 Weibo Payment also gives Apple a new CRM tool as it localizes it marketing efforts for China. For example, its Tmall store is currently getting ready for “Red Friday” promotions on January 10, an annual promotional event by retailers to herald the upcoming Lunar New Year holiday.